From Coraline, the stop-motion movie adaptation of Neil Gaiman’s fun and spooky book! 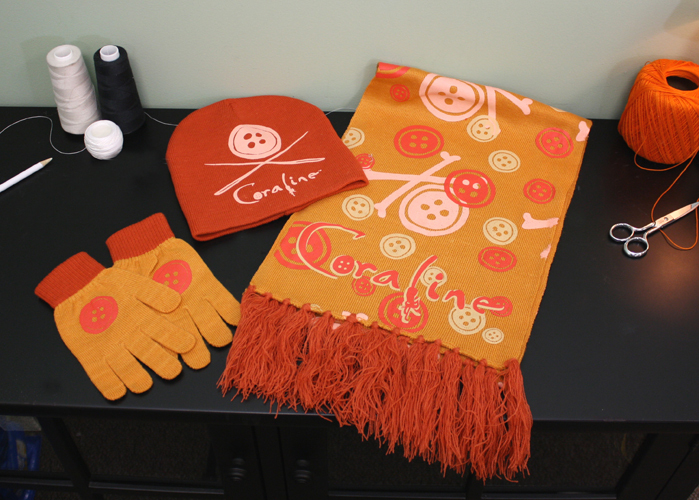 This matching hat, scarf and gloves set is perfect for any chilly day. The printed art features skulls and crossbones made of buttons and needles. Set includes stretchy gloves, beanie hat and fringed scarf. One size fits most; scarf measures 68″ L x 11.5″ W (including fringe). Soft knit acrylic. Hand wash, air dry.